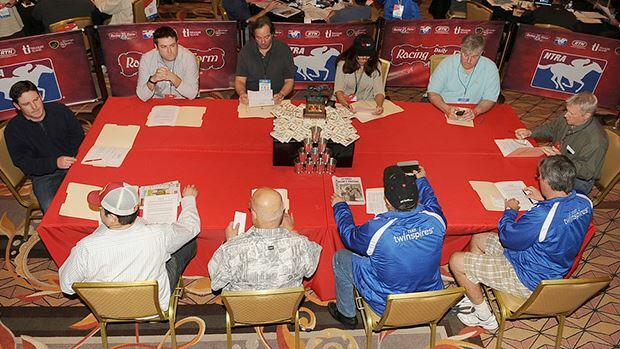 The Daily Racing Form/NTRA National Handicapping Championship (NHC) Presented by Racetrack Television Network, Sovereign Stable and Treasure Island Las Vegas is down to 10 players, led by Jose Arias with $331.20. The 10 leaders will compete in a first-ever Final Table tournament this afternoon to settle the final placings, including the $750,000 grand prize and Eclipse Award winner. Beyond Arias, the rest of the top 10 is comprised of Nick Alpino ($321.30), Michael Piccola ($310.80), Christopher Skotz ($300.80), Tony Brice ($298.80), Daniel Kovalesky ($285.30), Mike McIntyre ($283.60), Ryan Flanders ($281.80), Paul Shurman ($277.60) and Lynn McGuire ($273). Standings are unofficial until completion of a final audit within the hour. The top 10 players carry their bankroll from the Final 50 contest over to the Final Table, where they will place $2 Win and Place wagers on each of five mandatory races (all times Pacific): Gulfstream, Race 10 (2:03 p.m.); Gulfstream, Race 11 (2:33 p.m.), Fair Grounds, Race 9 (2:55 p.m.); Santa Anita, Race 8 (4 p.m.); and Santa Anita, Race 9 (4:30 p.m.). The final NHC race, the ninth at Santa Anita, is a $12,500 claiming event ($16,000 purse) for older non-winners of two races at six furlongs with a field of 11. To reach the Final 50, the 500 NHC entrants were required to place 30 mythical $2 Win and Place wagers – 15 on Friday and 15 on Saturday. This is the first year with a three-day format including the Final 50 and Final Table. Final Table participants will be relocated to a single table at the front of the Treasure Island Las Vegas ballroom that has served as Contest headquarters. The Eclipse Award for Handicapper of the Year and $750,000 in cash is on display at the center of the table as a reminder of what is at stake. The Consolation Tournament for players outside of the Final 50 was won by Nisan Gabbay of San Francisco, who tallied a $145.60 bankroll from 10 mythical $2 Win and Place bets (three mandatory and seven optional) to take home the $20,000 first prize, as well as a $10,000 Breeders’ Cup Betting Challenge package including entry fees, live bankroll, airfare and hotel. The top 20 Consolation Tournament finishers earned cash prizes, tiered from $1,000 to $20,000. The full NHC and Consolation Tournament standings can be accessed at ntra.com.